A temporary free clinic in Houston, TX. There’s a giant fear running around out there that a government-run health care system is going to create the rationing of health care. Americans needn’t be afraid because, guess what? Rationing already exists in our current healthcare system. What is a life worth? And are some worth more than others? 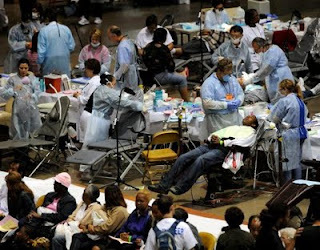 The National Association of Free Clinics recently set up a temporary clinic in New Orleans to offer health care for those without insurance. Ninety percent of the patients who came through the clinic had two or more diagnoses. Eighty-two percent had a life-threatening condition such as cardiovascular disease, diabetes, or hypertension. Some hadn’t seen a doctor in a decade. One woman went home without a referral, choosing not to treat the stage-four breast cancer that had gone undetected because of her lack of insurance. This picture of people in need of serious care is just one example of the rationing that’s happening all over the country. A study was just released by Harvard University showing that uninsured Americans are more likely to die in the Emergency Room than those who are insured. Experts in the field say that patients without insurance are often transferred to “financially strapped” hospitals with less equipment and less staffing. Hmm…some people getting to stay at the hospital that has more life-saving equipment and staff, and others being sent away. Sounds an awful lot like rationing to me. Add up an employer-based health insurance system and more than 2 million jobs lost already in 2009, and you get a whole lot of people without access to health care. Tell those people you’re worried about health care rationing and they will laugh in your face (or possibly hit you). It’s clear that rationing has to happen in some regard – Peter Singer points out in his New York Times article “Why We Must Ration Health Care” that if you believe there is any limit whatsoever on the price that should be paid to keep a person alive for any amount of time, then you believe in rationed health care (including, as he points out, 1 million dollars to extend a person’s life by 6 months). The truth of the matter is that for all of us to be able to visit the doctor when our bones break or when illness strikes, something has to give. It seems that we’re very willing to talk about a few cancer patients who are being denied expensive life-extending medication, but are unwilling to broach the subject of the 45,000 Americans who die every year because of their lack of health insurance. Perhaps what people mean when they say “I don’t want the government to ration health care” is “I don’t want the government to ration my health care.” Isn’t it about time we thought about the greater good on this one? Or is that just an antiquated socialistic notion.